Anne Hume was the Chief Librarian of Windsor Public Library from 1936 to 1956. At the time of her retirement, one of her colleagues praised her as the “mother of Essex County library services” (W.K. Sidey, quoted in the Windsor Daily Star, April 29, 1957). 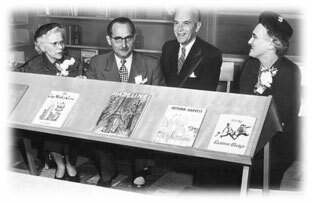 Ms.Hume, seated left with other library officials, at the 1953 opening of Seminole Branch. of the area’s early cultural clubs, The Arts and Letters Club. As a founding member of the Windsor Art Association, she arranged for the first regular programme in Windsor of exhibits from the National Gallery of Canada. She also arranged for the first-ever exhibit of material to be loaned from the Royal Ontario Museum and shown at Willistead. Always the consummate professional, she contributed to library literature throughout her career and wrote histories of Windsor libraries and its arts movement. For a number of years, Hume was a guest lecturer at the University of Toronto Library School. She served as president of the Ontario Library Association as well as the Canadian Library Association. Anne Hume died at her home in Campbellford in 1966. Windsor Daily Star, April 29 1957, p. 23.